On June 24, 2011, the New York State Senate passed the Marriage Equality Bill, allowing us to finally legalize our nearly 24-year relationship. Wow! We were swept up in the moment and started planning our wedding even before the end of the 30-day waiting period. After all these years, we felt we had waited long enough, and planned our wedding for August 2nd. The day we booked the beautiful 1800s tea salon in New York’s Gramercy Park for a champagne afternoon tea, we realized that we had only 3-and-a-half weeks to plan an entire wedding. Gulp! That night, we invited 35 guests and researched registries. We knew we couldn’t have a typical store registry, because after living together all these years, we already had Grandma’s china and silver and pretty much everything else we needed. We started to wonder what other long-term couples do when all of a sudden they decide to marry after years of living together. Then we looked around our apartment and realized that our furniture had gotten a bit shabby and wasn’t very comfortable. We needed a home makeover! We found an online registry, uploaded a photo and a poem, chose our items, and were about to hit “register” when we realized we hadn’t done our typical copious research. Five-minutes on Google, and we saw that the company had by far more complaints than compliments, and so many “hidden” fees that we would have to spend almost more than we would receive. And here our poem was so perfect and even incorporated the registry name! Now we were back to square one – we thought – and Googled other registries. We saw the countless rave reviews of SimpleRegistry, and it wasn’t until we’d uploaded the whole package that we realized that our invitation had included the following: <em>“Your presence is all that we ask for and is more than enough to fill our hearts. However, some have asked about presents, and asked us to create a registry, so in the interest of simplicity and ease, we registered at SimpleRegistry”</em> Seemed rather serendipitous to us and we didn’t have to change a thing! Well, this made it so easy for our guests to participate. We certainly didn’t want anyone to run around trying to think of a gift for us, and as we said at the time, “We don’t want anyone to feel pressured or rushed. That’s our job.” All of our guests were delighted with the whole idea, and loved contributing to such items as “Comfy cozy bed” and “Doors for closets we’ll be proud to come out of.” And our younger nieces loved throwing their hard-earned cash to our Sephora wedding makeovers. They thought that was awesome. So, the wedding was beautiful and joyful and everything we’d hoped for. Our apartment looks amazing and now we truly have everything we want. 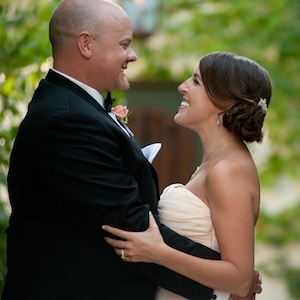 SimpleRegistry made those 3-and-a-half weeks SO much easier for us and for our guests. Transferring the money into our account was a snap, and we appreciate the integrity of a site that lists its (minimal) fees up front in big print.